Have you ever over done an activity on the weekend, only to awaken on Monday so sore that you had trouble getting up and moving? Muscle soreness can strike any time you over-do an athletic activity, or do too much yard work or just generally exceed your fitness level with an activity. It can take hours or even days sometimes to get the soreness to subside if everything is working correctly. Now, imagine that everything is not working correctly for your muscles, on a cellular level. You can imagine that muscle cramps that are incapacitating and long lasting could be really painful, and possibly even dangerous. If your muscles weren’t getting the chance to recover, then you could even have trouble breathing and lose your appetite. 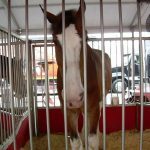 These are some of the issues that your horse might face if they have ever had experience with an equine muscle disorder. Equine muscle disorders, or myopathies, come in many different variations. Many of them are lumped together and called “tying-up”. The realities are more complex than just one simple cause of being over worked and causing soreness. Depending on the breed and age of your horse, and the way that they present with signs of “tying-up” your vet may have some suspicions as to what is going on. These issues can present as stiffness, lameness and sometimes even appear to be causing colic in a horse. Usually there is a history of some recent work that was above the fitness level of the horse. Very fit horses are NOT excluded from some of these problems, although the current training level of the horse is important background information as well. 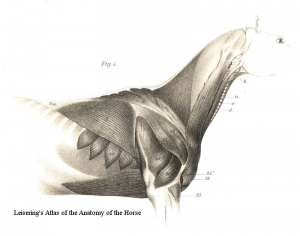 Let’s find out a little bit about some of the more common equine muscle disorders. Polysaccharide Storage Myopathy (PSSM or EPSM)– This genetic disease causes the horses’ muscle cells to inappropriately store polysaccharide in the muscle cell during work, causing damage to the cell. Horses present most commonly with muscle stiffness, sweating, and reluctance to move (due to pain). There are two types of PSSM recognized, and there are some breeds that are more likely to have this genetic mutation. Quarter Horses (especially halter horse-type quarter horses) are recognized as having a higher incidence of PSSM. Also, continental European Draft Breeds (Belgian and Percheron) along with some heavy warmbloods can have PSSM. Sometimes these horses can be managed with a low starch/high fat diet and a controlled exercise protocol, but other times horses need to have a new job. Hyperkalemic Periodic Paralysis (HYPP)– This genetic disease is often times confused for one of the disorders that cause tying-up, but is completely different. 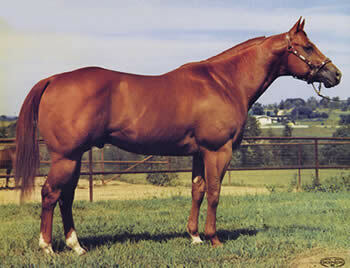 It is entirely limited to Quarter Horses that are related to a specific sire, named “Impressive”. It was a natural mutation that was propagated through breeding for the trait which went with it of “double muscling”. 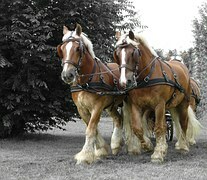 This meant that these horses are VERY well muscled, and even look muscle bound in extreme cases. There are defective sodium channels in these horses and when they get their serum potassium too high (through diet, exercise, excitement sometimes) they can have varying degrees of paralysis occur. This can look like any of the above symptoms (soreness, trembling, colic) or even cause death. Careful dietary management and exercise plans are necessary to manage these horses, but even one defective copy of the gene means that the horse could have a full blown event. Exertional rhabdomyolysis (ER)– One of the more classic cases of “tying-up” this can cause tightness over the back and croup and hindquarters areas following exercise. There is more than just one cause to each horse, and there are both one-time (sporadic) events and chronic cases. 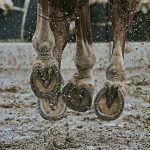 One time cases are usually due to an increase in training in excess of the horses’ fitness level, whereas some horses can have chronic cases that can threaten their careers or even their lives.